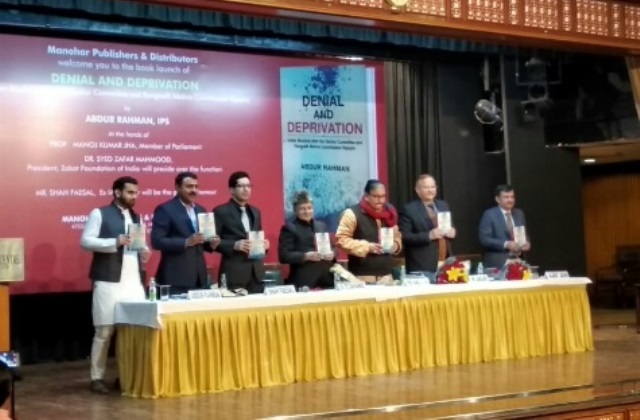 Just few days back, a book titled ‘Denial and Deprivation: Indian Muslims after the Sachar Committee and Ranganath Mishra Commission reports’, authored by Mr. Abdur Rahman who is currently civil servant (IPS) of Maharashtra cadre, was released by the Prof. Manoj Kumar Jha, a renowned academician and currently Member of Parliament Rajya Sabha from RJD at the Indian Islamic culture Centre on 8th February 2019, New Delhi. The meeting was presided by the Dr. Syed Zafar Mahmood (President, Zakat Foundation of India) and Mr. Shah Faesal, Ex-IAS officer who was also present as the guest of honour. Besides, the meeting was also overwhelmingly attended by the students and academics belonging to JNU and Jamia Millia Islamia, New Delhi. While making his initial remarks, Prof. Jha has said that we should not look at the Muslim community as ‘homogeneous lot’, but like other communities, Muslims are also divided into the lines of caste and class. To note: The author is a research scholar at Department of Political Science, University of Delhi. I am particularly grateful to Wakeel Ahmad research scholar who has done his Ph.D from JMI for reading the draft and giving thoughtful comments and suggestions.